Revox PR99. Illustration courtesy Revox of Switzerland. 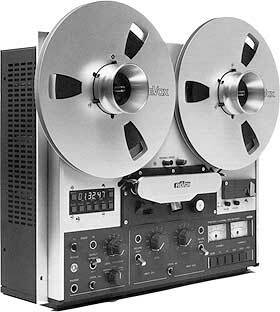 This is a list of former reel to reel and cassette component tape deck brands and manufacturers. Home stereo component tape decks are obsolete and, as far as I know, none of these once well known brands of tape decks are still available. The recordable CD made magnetic tape, and particularly the once dominant compact cassette format developed by Phillips, a thing of the past. Many of the brands listed below are gone, while others (such as Nakamichi and Teac) offer other types of components today. Often these are CD players. Tape decks, particularly the reel to reel variety from the top manufacturers (such as Revox, Crown, Tandberg and Nagra), were very well made and durable components. The best cassette deck brands also have a following, particularly Nakamichi and Harman-Kardon. There is still some interest, among vintage component enthusiasts, in quality tape decks, so a small used market remains. Prices for used tape decks are typically low. Remember that cassette and reel to reel decks have motors, belts, bearings and other moving parts that wear out, like any mechanical device. Any vintage tape deck will likely need some reconditioning to perform to original specification. Finding tapes to play and record can also be a problem. The list that follows includes only companies that I know something about, either first hand, through audiophile friends and reviewers, or by reputation. They are (or were) recognized in the audiophile community. This list is not exhaustive; there are brands that are not on this list. If I have left out your favorite, it doesn't mean it's no good, only that I am not familiar with it. However, if you are looking for a used cassette or reel to reel tape deck, this list should provide a place to start. Copyright 2011, 2012 by Chuck Hawks. All rights reserved.